LSU started 13-0 last season but finished 13-1. The number on the right side of the dash received far more offseason attention than the one on the left, and at times, it was almost as if last season was a disappointment. The loss, of course, came in the national title game, to SEC West rival Alabama – the same Alabama team LSU had beaten in Tuscaloosa about two months before the championship showdown. 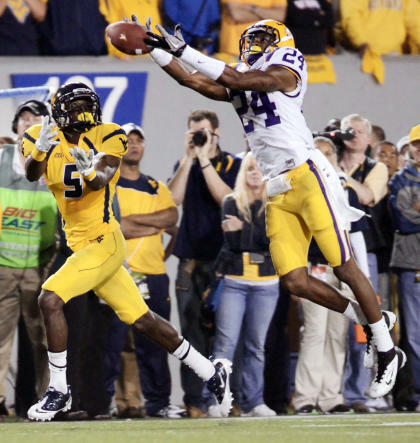 The Tigers' offensive ineptitude in the title game was a recurring offseason theme, as in "Will LSU's offense be any better in 2012?" Actually, as long as Les Miles is coach, LSU always is going to rely on a power running game, which means the Tigers' offense will be just fine this season. LSU returns four starting linemen and its top four tailbacks. LSU will be salty again defensively, especially in the front seven. There is a little bit of angst about the secondary now that star CB Tyrann Mathieu has been dismissed from the team for a violation of team rules. Still, there would be more angst if the Tigers played in the Big 12. The SEC isn't exactly filled with powerful passing attacks. The SEC West race should come down to the same teams this season, and LSU has enough talent to take the division crown – and the league title – for the second year in a row. Returning starters (minimum 7 starts last season): Offense (6) – WR Odell Beckham Jr., T Chris Faulk, T Alex Hurst, C P.J. Lonergan, TB Spencer Ware, G Josh Williford. Defense (4) – T Bennie Logan, LB Kevin Minter, E Sam Montgomery, FS Eric Reid. Special teams (2) – K Drew Alleman, P Brad Wing. Fast fact: LSU has lost just home games in Miles' seven seasons. The Tigers currently are riding a 17-game home winning streak; the last loss came in 2009 to Florida. One of the most closely watched quarterbacks nationally this season will be Tigers junior Zach Mettenberger. He's a big guy (6 feet 4/223 pounds) with a strong arm and all the needed physical tools, but he is far from a sure thing. He began his career at Georgia before leaving after some off-field problems. 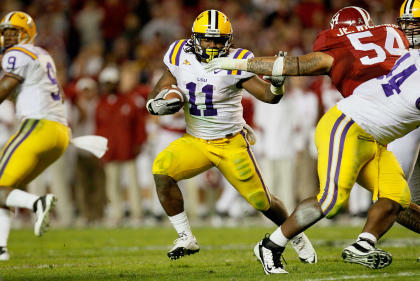 He played well in his one season in junior college, then enrolled at LSU in January 2011 and went through spring drills. He was underwhelming, so underwhelming that he couldn't beat out either Jordan Jefferson or Jarrett Lee last season. He played in five games, throwing a pass in just one of them, a rout of FCS member Northwestern State (La.). He was 8-of-11 for 92 yards and a score in that game. Expectations are high for Mettenberger. He is a more polished passer than Jefferson or Lee, and the hope is he provides a spark for a passing attack that has been mediocre, at best, the past few seasons. Thing is, as long as Mettenberger merely is adequate, the offense should be fine. LSU is loaded at tailback and along the line, meaning the Tigers should be able to run the ball on anybody. LSU has four backs who rushed for at least 336 yards and seven touchdowns last season; three of those guys ran for at least 539 yards and seven scores. The best tailback looks to be junior Spencer Ware, who was a high school quarterback in Ohio. None of the backs are true speed merchants, but Ware can get around the corner and run over a linebacker in the process. He had 707 yards and eight TDs last season. The leading rusher was junior Michael Ford, who finished with 756 yards and seven TDs. He had six games with fewer than 10 carries and five with six or fewer. Junior Alfred Blue had 539 yards and seven scores, and he had more than nine carries in just three games. Then there's sophomore Kenny Hilliard, a brutish runner who ran for 336 yards and eight TDs. Almost half of his carries (29 of 62) came in games against Auburn and Arkansas; he gained 167 yards and scored three TDs in those two contests. He's probably the second-most talented back behind Ware. When the Tigers use a fullback, it's usually J.C. Copeland, a 280-pounder who can knock folks over as a blocker. The early departure of Rueben Randle to the NFL means the Tigers are looking for a new go-to receiver. Sophomore Odell Beckham Jr., who had a big freshman season, almost assuredly will be that guy. Senior Russell Shepard is a former five-star recruit who played quarterback in high school and never has grasped the nuances of playing wide receiver. Keep an eye on sophomore Jarvis Landry, a good athlete who played in every game last season but made just four receptions. Senior TE Chase Clement is a good blocker, but he has just nine career receptions. No other tight end on the roster has a college catch. The line will be one of the two or three best in the nation. Four starters are back: Ts Chris Faulk and Alex Hurst, C P.J. Lonergan and G Josh Williford. The other guard likely will be senior Josh Dworaczyk, who started every game in 2009 and '10 before missing last season with a knee injury suffered in fall camp. Sophomore La'El Collins is vying with Dworaczyk for the starting job. This season's line should be better than last season's. The Faulk-Hurst tackle tandem is one of the three or four best in the nation. Defensively, there is a plethora of linemen, an OK group of linebackers and one of the best defensive backs in the nation in FS Eric Reid. All in all, this unit looks loaded again. As with its offensive tackles, LSU has one of the nation's top end duos in Sam Montgomery and Barkevious "KeKe" Mingo. Neither is that big (Mingo is 6-5 and 240, and Montgomery is 6-5 and 260), but both are athletic and can wreak havoc off the edge. Montgomery had nine sacks in 2011, No. 4 on LSU's single-season list; Mingo had eight sacks and 15 tackles for loss. Seniors Chancey Aghayere and Lavar Edwards are the top backups; they have 15 career starts between them. LSU lost T Michael Brockers early to the NFL draft, but remains deep at the position. The standout should be junior Bennie Logan, who wears a quarterback number (18) but definitely isn't a quarterback. Logan has a quick first step and put it to good use last season, finishing with 57 tackles, three sacks and 6.5 tackles for loss. As with the two starting ends, he should vie for, at the least, all-league mention. Sophomore Anthony Johnson, a former five-star recruit nicknamed "The Freak" for his athletic ability, should start alongside Logan. Sophomore Ego Ferguson, redshirt freshman Quentin Thomas and senior Josh Downs add depth. Downs has played extensively in his career, but is LSU's fifth tackle. Kevin Minter is the lone returning starter at linebacker, but LSU uses a lot of nickel sets, so the lack of experience isn't that big a problem. Minter is solid against the run. Tahj Jones and Luke Muncie likely will join Minter in the starting lineup, with junior Lamin Barrow and true freshmen Kwon Alexander, Lamar Louis and Lorenzo Phillips also in the mix. Miles seems especially high on Jones and Alexander. Mathieu's dismissal hurts. LSU had the nation's best cornerback duo last season in Mathieu and first-round pick Morris Claiborne, but both are gone. Junior Tharold Simon played a lot in nickel and dime sets last season, and had two picks and 10 pass breakups. He will hold down one corner job and should contend for all-league honors. Redshirt freshman Jalen Collins, who had an excellent spring, should get Mathieu's starting spot. He has good size (6-2/195) and is a former four-star recruit. Depth at corner? Yikes. Three true freshmen, Jalen Mills, Derrick Raymond and Derrick Thomas, will vie for the No. 3 job, with Mills, a four-star signee, the top candidate. True freshman Kavahra Holmes signed as a wide receiver, but has practiced at corner since Mathieu's departure. Reid is one of the top two or three free safeties in the nation. He covers a ton of ground – he'll have to cover more with Mathieu gone – and had 76 tackles, two interceptions, three breakups, two forced fumbles and a fumble recovery last season. The new strong safety will be Craig Loston, a big hitter with good speed but only so-so instincts. Depth at safety is lacking, as well. Redshirt freshman Micah Eugene looks to be the No. 3 guy; he also can play corner and could see time in the nickel and dime sets. Sophomore Ronald Martin also should play. LSU has one of the best kicker/punter combinations in the nation with senior K Drew Alleman and sophomore P Brad Wing. Alleman is a former walk-on who 16-of-18 on field goal attempts last season, though he was just 3-of-3 from at least 40 yards. Wing is an Aussie who attended his senior year of high school in Baton Rouge. He averaged 44.1 yards per punt, and 23 of his 50 attempts landed inside the 20. Mathieu was one of the best punt returners in the nation, and the Tigers also are looking for a new kick returner. Landry, Beckham and Shepard are the leading candidates for the two jobs. LSU's coverage teams were excellent last season. The Tigers have just four road games this season, and play their first three, four of their first five and five of their first seven at home. There is just one legit non-conference matchup, and that is Game 2 against Washington. The other non-league foes are North Texas, Idaho and FCS member Towson. Interestingly, the first two SEC games are on the road, against Auburn on Sept. 22 and against Florida on Oct. 6. The other road games are against Texas A&M and Arkansas. Alabama and South Carolina must travel to Baton Rouge. The Nov. 3 game with the Tide already has been selected for a prime time kickoff by CBS. That should determine the SEC West title, and the winner very likely will wear the "Best Team in the SEC" tag as well. Losing Mathieu hurts; the guy was a big-play machine. But the Tigers still can win the SEC West without him, which means they still can win the national title without him. The rushing attack should be excellent. If the Tigers don't average at least 220 rushing yards per game, something is wrong. And if Mettenberger does live up to the hype, this team will average 43 or so points per game. Thing is, with this defense, the key for the offense is not to screw things up. The front four is just plain nasty, and the Tigers easily go 10 deep up front. Reid is a playmaker on the back end, and there is supreme speed everywhere. The Tigers can roll their helmets onto the field and win 10. They should win at least 11, and a 13- or 14-win season certainly is within reach. A 14-win season, of course, would mean the national title. • Shine: Back to school with Gucci backpacks and Lanvin furs?